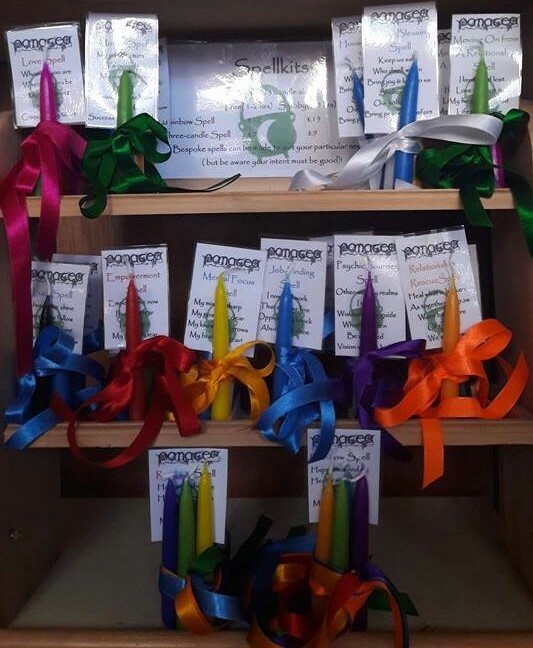 The candles I sell come in all colours of the rainbow, plus pink, black, white and natural beeswax. They also come in three sizes: standard tapers, 'stubbies', and tree/spell candles. They are made in the traditional dipping method by Moorland Candles of Cumbria. They are solid-colour, steady-burning, high-quality candles, and the colours are gorgeous. The spells listed here are my standard ones, but if you have any special intention, and have difficulty making one up for yourself, as long as it is well-intentioned and will not harm anyone else, I can make one up for you. The idea is to place the candles near to each other in a space-out triangle, with the ribbon loosely arranged around the (though not touching them). As you light each candle, recite the spell (when all candles are lit, you will have recited it three times). Stare at the flames for a few minutes, visualising your need. Don't concentrate on what it is that you want, but on what you will feel like when you have it/have accomplished it. Let the candles burn down in a safe place, then keep the ribbon (which has absorbed the candles' energy) in an appropriate place. Standard spells: House Blessing, Money, Relationship Rescue, Psychic Journey, Love, Mental Focus, Empowerment, Moving on from a Reationship, Job Finding, and Luck. 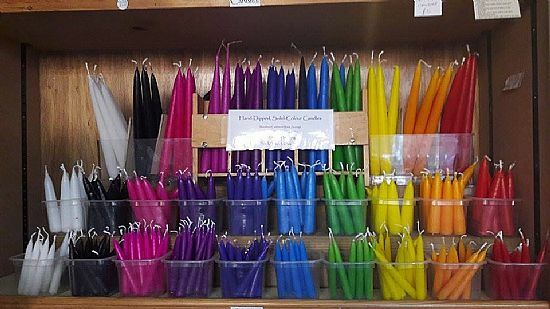 This consists of seven candles (one for each colour of the rainbow), and seven matching ribbons. The idea is to bring in blessings to your life and home in general. It is a lovely gift to give to someone as a housewarming. I have always done it whenever I have moved into a new house...the results have always been pleasant, if often quite unexpected! Place each candle with its' corresponding ribbon in seven different rooms (or seven areas of your room if you have just the one). Light each candle and visualise the colour filling your whole being, then spilling out and filling the room with swirling sparkling colour, sweeping away darkness and negativity. Continue until all seven are lit, and in your mind both you and your world are filled with rainbowed, shimmering light. Let the candles burn for about ½ an hour, thinking of anything that makes you smile or laugh. Lift your spirits! Extinguish the candles and repeat on successive nights until the candles are burned away. This should take the best part of a week. When the candles are finished, weave or plait the ribbons together, and hang by a doorway or a window. They make a pretty and protective talisman, for keeping your home free of negativity. Purple/Violet/Indigo Mental healing, psychic ability and hidden knowledge. Spiritual power, wisdom, vision. Dignity and fame. Green Physical and emotional healing. Growth and personal goals, prosperity. Tree and plant magic. Love, fertility. Yellow Intelligence, memory, learning. Imagination backed by logic. Clearance of mental blocks. Red Passion, courage, emotional intensity, strength, action and driving force. Survival, career goals. Blood and heart healing. Pink Affection, romance, caring, nurturing. Emotional healing, friendship. Innocence, creativity. White Purity, peace and spirituality. Focus, protection.White contains all colours, so it can be substituted for any other. Black Binding, protection, removal of negativity and grounding. Beeswax Good in house protection spells, and those concerning work and career.